Electrical diodes pass current in only one direction thanks to materials that behave in a nonlinear fashion. In optics there is something similar called a Faraday Isolator, a type of optical diode based on a magnetic crystal that lets light pass through only one way. Consider a line of triangular holes in a solid surface. We can send in surface acoustic waves from either direction. The triangles interact with the waves differently according to the direction of incidence. We carried out such an experiment on tiny triangles, as shown below. By analysing at certain frequencies, we find that the structure transmits better for waves incident on the vertices. Such "asymmetric" transmission through an asymmetric structure is rather obvious. Two further examples are shown below. 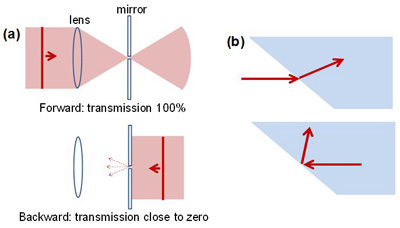 The first is a lens and a mirror with a small hole placed at the focal plane of the lens; a collimated beam incident from the left is transmitted through the device, whereas a collimated beam incident from the right is almost entirely reflected. The second is total internal reflection: a p-polarized ray incident on the interface at the Brewster angle is 100% transmitted whereas a ray incident from the opposite direction is 100% reflected. Examples of asymmetric structures with "one-way" transmission. (a) A mirror with a hole in the focal plane of a lens. (b) Total internal reflection. Here is a third, perhaps more familiar, example: a megaphone. 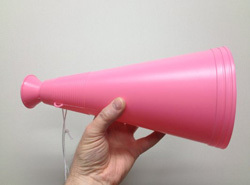 A megaphone is designed for one-way transmission. They won't hear you very well if you speak through the wrong end! Should we call such linear asymmetric structures "diodes"? The answer is no. If we reverse the refracted beam in the internal-reflection example it will be 100% transmitted through the interface. The same is true for the triangles (also a linear structure): to attempt to demonstrate such a diode effect all the scattered waves would need to be reversed, rather than merely switching the incidence direction. In a new paper, we discuss what is meant by the term "phonon diode", including the case of thermal diodes for heat flow based on phonons, invoking a theorem well known in electromagnetism but less so in acoustics known as the reciprocity theorem. We conclude that for linear materials it is not possible to make a diode, and we discuss potential pitfalls in interpretation in this field. 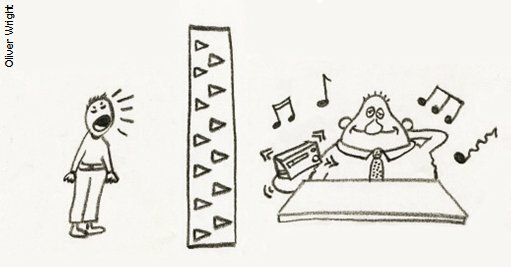 We also note that no-one has made a bona fide acoustic diode yet, and that the term "phonon diode" should in fact be trashed! So what can the reciprocity theorem say about the megaphone? Just that megaphones also make excellent hearing trumpets! "What is a phonon diode?!" See 'Reciprocity in reflection and transmission: what is a "phonon diode"?,' A. A. Maznev et al., Wave Motion 50, 776, 2013. Our experiments on triangles are here: 'Real-time imaging of acoustic rectification,' S. Danworaphong et al., Appl. Phys. Lett. 99, 201910, 2011.